Listening to these two tracks recently got me thinking about the complex concept of “authenticity” with relation to commercial recordings in certain regions. I’ve broached the subject several times on Excavated Shellac, and still find it a worthy discussion to ruminate upon. I suppose the overarching rhetorical question is: how do we treat these recordings in the present-day? 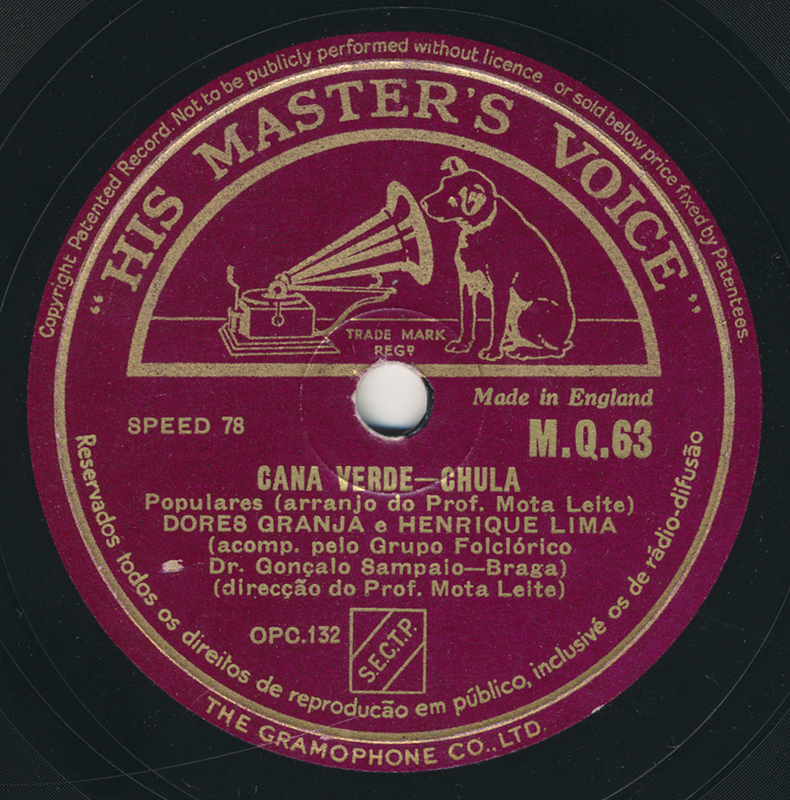 The first piece is a folk song from Portugal, recorded June 17, 1947, in Braga. For better or worse, the might and popularity of fado usually eclipses the other regional styles that have existed in Portugal for centuries. There’s unaccompanied polyphonic singing from the south, bagpipe music from the northeast, accordion bands, and all manner of rancho folclóricos performing regional music across the country. This piece is from northwest Portugal, specifically the area once known Minho province (now the Viana do Castelo and Braga provinces). It is a chula, a localized circle dance for couples. The singers Granja and Lima are accompanied by a chorus, drum, and multiple four-stringed cavaquinhos, the small guitar of Portugal which was apparently the original model for the ukulele, brought to Hawaii by Portuguese sailors. But, it is probably safe to say that this piece was, in one form or another, mediated by the Salazar dictatorship in Portugal, which apparently exercised strict control over all cultural activities. During the dictatorship, folk music groups – the aforementioned rancho folclóricos – were part of the nationalist organization known as FNAT, or Fundação Nacional para a Alegria no Trabalho – meaning “The National Foundation for Joy at Work.” And FNAT is represented here on this recording with the presence of Professor J.C. Mota Leite (credited as the director of this performance) and the Grupo Folclórico do Doutor Gonçalo Sampaio (who accompany the lead singers). During this period, FNAT was involved in essentially fostering a revivalist spirit throughout the country with these groups. The Grupo Sampaio, formed in 1943, worked closely with FNAT and worked to create what scholar Kimberly DaCosta Holton calls “an authentic duplicate of regional tradition.” Mota Leite, a folk music scholar, was hired by FNAT to train the group for months, acting as a bridge between the members of the group, who were peasants, and the dictatorship nobility. Now that we know this about the recording, will we feel differently about it after listening? Do we have the capability to take it at face value, or is it fraught with the politics of the day? Does the fact that this recording is in the renowned Constantin Brăiloiu archive of folk music change anything? The second piece is from Tajikistan. Under Stalin, the nationlist influence on the manifestation of folk music traditions was in full effect. Rena Galibova (1915-1995) was born in Uzbekistan, of Buhkaran Jewish heritage. She eventually moved to Tajikistan and became a trained opera singer. Her career was lengthy, through decades of Soviet rule – she performed for Stalin, and gained the title “People’s Artist of Tajikistan.” She eventually moved to Boston, Massachusetts, where she passed away at age 80. This piece has something similar to the typical “folk music ensemble” sound of Central Asia in the Soviet 78rpm era. You can hear a violin, the dayra frame drum, the nay flute, and the chang zither (oddly, I don’t hear a tar or dutar). Apparently Galibova also sang traditional Bukharan shashmaqam. 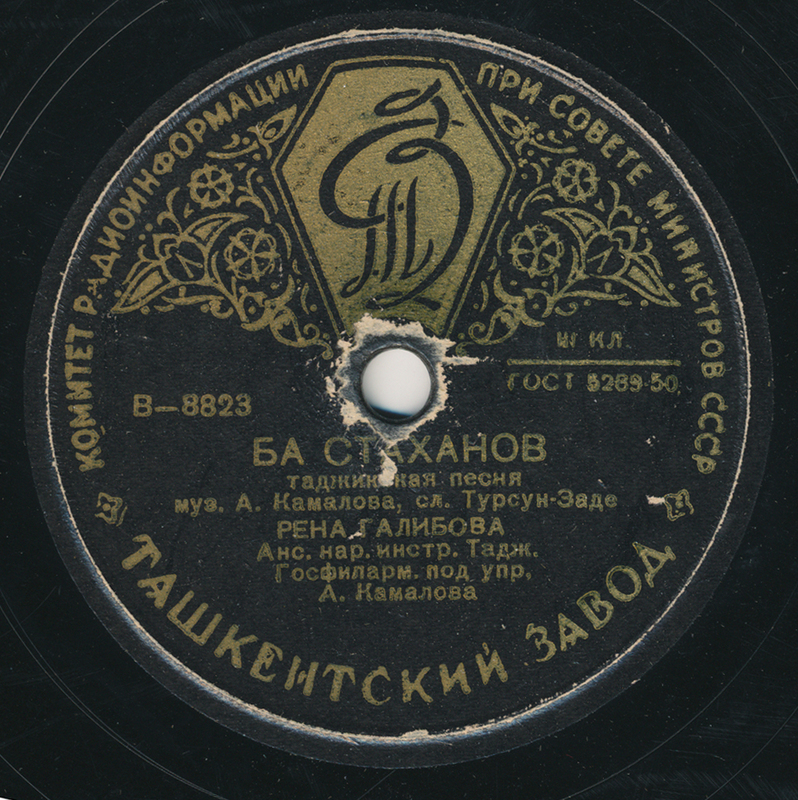 I would love to be able to hear that some day, yet Tajik records – even the classical, operatic ones – are incredibly difficult to find. Which leads me again to our questions: can we approach this music at a level disassociated from its political past? Will the discourse always be messy? Or is it essential background information that is needed in order to give the music its proper context? If the Garland Encyclopedia of World Music calls this Soviet ensemble style “bloated” and “ponderous” – does that mean it’s improper to hum? It’s quite likely that the Stakhanov in this track is the “Hero of Socialist Labor” Alexey Stakhanov (1906-1977). *Spinetti, Federico. (2005). Open Borders. Tradition and Tajik Popular Music: Questions of Aesthetics, Identity and Political Economy. Ethnomusicology Forum, 14(2), 185-211. Thanks to Bill Dean-Myatt for discographical information, and to Steve Shapiro. The Portuguese track is reminiscent of Brazilian Nordestino music from the same period, but it’s joyless by comparison, which perhaps reflects the political context (no doubt the lack of African rhythmic influence reinforces the impression of joylessness). So, in answer to your question “can we approach this music at a level disassociated from its political past?”, I’m simply not sure I’d want to approach this music. The Tajik track is better, and thus the question becomes more relevant. It’s the likes of the stunning output of Guinea’s Syliphone Records, however, which bring the question into sharper relief for me. I absolutely love Syliphone’s music. It may be possible for someone to educate me to a point at which my conscience spoiled my enjoyment, but that would be something of a shame. Truly joyous, spirited music should be enjoyed, even if it is the flower that grew on top of a particularly noxious pile of manure. Thanks for a stimulating post. Thanks for your comments, Dennis! Much appreciated. Interestingly, some music of northern Portugal has more in common with the bagpipe and “processional” sounding music of nearby Galicia, Spain. So, I couldn’t answer whether what they are performing here – joyless or not – was an accurate rendition of a folk motif. It might very well be quite accurate. Also of note – “chula” exists in Brazil, too, but as a completely different type of music. I agree with Dennis that the Syliphone recordings are a perfect example of how political interference/control doesn’t necessarily make for bad music. He also touches on the related question of whether unsavoury political associations can/should affect our appreciation. That’s a trickier one, and maybe more subjective, although there’s no doubt in my mind that sometimes I can enjoy records more when I don’t understand the lyrics! But music’s context is important to me – I’ve never been one of those who felt that there’s only good music and bad music and nothing else counts – so your notes lend a layer of additional perspective to my thinking about these records. Which, no doubt, makes me listen a bit more closely – I still couldn’t say that I find either of them joyless, but maybe there is some spark that the ideological pressure has managed somehow to dampen. Well put, Gracenotes – I appreciate your words. It’s a complicated subject, for sure. After listening Granja e Lima, doing some research on chula and minho region music i found some elements in common with italian “tarantella” and spanish “jota”, like rhythm pattern, instruments or melody esthetic. Curiosly all three are a dance too, where dancers jump.